Hummus is a Middle Eastern spread made from chickpeas or garbanzo beans, and tahini, a paste of sesame seeds. It is typically eaten with pita or other flat bread. When I first tasted hummus a couple of years back, I disliked it instantly. Being new to the country and never having experimented with non-Indian food, I obviously needed time to get accustomed to eating pureed chickpeas. I believe that it is an acquired taste. But now, with time, I have grown to like hummus and even make my own these days. You can buy hummus in most grocery stores, but it's so easy to make and so much more fun to make your own by experimenting with the ingredients and adjusting the flavors just the way you want it . Tahini too can be easily found in your local grocery store, but it can be made at home too. Here’s an easy way to make your own tahini. I used store-bought tahini for making this. Adding too much adds a slightly bitter taste to the hummus. Through trial and error, I have arrived at the proportions indicated below and this has been working well for me. Place all the ingredients (except the oil) in a food processor and blend well. Add the olive oil in a thin stream, with the processor running, till everything comes together to form a smooth paste. Season with salt. Serve with toasted pita triangles. Pretty looking Hummus TBC. I've never tried adding roasted red peppers before... will try that next time. I couldn't have read this at a better time, I just bought canned Roasted red peppers...yippee! :) I'm gonna try this soon TBC..thanks for the recipe, hummus looks amazing..Love Hummus! Yum yum! looks great! peppers in hummus must have tasted great! I regularly make hummus, next batch will be prepared this way. I agree, the homemade version is much better than the storebought one. LOVELY!wish i could have some right now. Substitute chickpeas with mayonnaise and omit cumin - you get aioli. Which is equally amazing with crunchy toasts! You have made me sooooooo hungry. That looks delish. I can't wait to try it. this has got to be one of the tastiest dips. we make it often and never tire of it. Lovely red color... must have been a sold out! Garbanzo Bean is a versitile pulse isnt it? The Garbanzo Bean noodle soup is one of my fav soups. Nice blog and the pictures are very clear and undoubtdly beautiful. 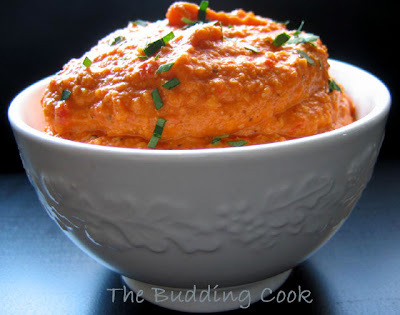 I love Hummus ('cept the mint version) but with red bell pepper, it looks fabulous!! This looks so good, i have never tasted or tried hummus. will sure try your recipe...I love chickpeas so I am sure i'll like this one too. Thanks. Such a nice photo of hummus, who/how can one ever resist it! Nice recipe TBC! I see many flavors of commercial hummus in the markets, but I doubt any taste as good as this colorful dish. You've heard this before, but are you quite sure you're a not an accomplished cook in disguise? very glamorous looking hummus. never made them at home though. I love the colour, can I have a bite please??? Best dip ever. This hummus is dressed gorgeously. I've tasted only plain hummus before. This is surely a nice variation. The color is superb. Lovely presentation. hummus looks colorful and beautiful pics. Hummmmmmmmmmmus...Very nice color of red pepper my dear looks yummy!!!!!!!!!!!!!!!! Oh you won't believe this, but his is popular here, I have never eaten with roasted red pepper, sounds terrific! Wow! nice blog. 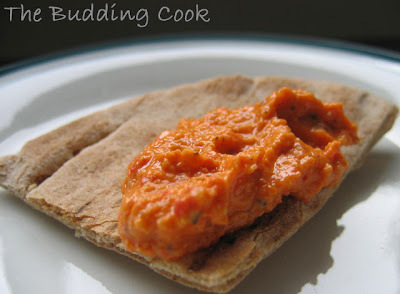 Red pepper hummus looks yummy! Added u to my blogroll. wow tat sure looks so yummy!!! n r blog is a popular one i c.. gr8!! This delicious hummus has been bookmarked my friend. Look at that strinkingly, beautiful colour! Coffee, TC, Bindiya, Nags, Sia, Cinnamon, Happy Cook, Asha, Richa, Sirisha, Bee, Grihini, Manasi, Rajitha, Padma, Sharmi, Dee, Gini, Kribha, Prajusha, Kajal, Sona, Cris- girls, thank you so much for taking the time to leave your trails here:-) It means a lot to me. Suganya,you had me confused there for a sec! Now, I wouldn't be able to call that a hummus, would I?;-). So you think my recipe is amazing , huh? Susan, I used store bought hummus once & decided that I had to make my own! First time in your blog. Hummus looks delicious. One of my kids favourites..looks great..! Rahin, thanks for stopping by. Seena,it is high in protein too... great for the kids. I am going to stop by at your blog for my daily dose of humor. Either way, do let me know how you like it. Pineapple pudding looks awesome...but 'm on a diet..so I quickly turned my sight off the dish...hummous looks tempting..loved both the dishes..
Love this recipe. I'm certainly going to try adding roasted red pepper, and cumin to my hummus next time. Ya...totally changing my blog look. Just sick of the current look! But its taking me waaaay to much time. Change is good;-) I am too scared to do anything to my blog 'cos I'm pretty sure s'thing wd go wrong & then I would have no idea how to fix it. Sabita: do let me know if you try it. 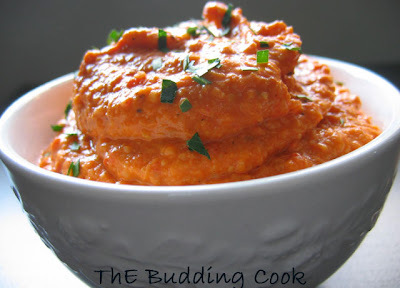 I love roasted red pepper hummus!The colour itself enlivens a party table! Valli, yes , the addition of the red pepper does give it a beautiful color. Thanks for this recipe! I have been planning on making hummus but now it will be sooner than later. You have a great collection of recipes here and I'll be stopping by often. Do let me know how you like it. Hope you are doing good. Its been long time since I checked your blog. I am definitely going to try out this sometime. just an ameture searching and googling for exciting new recipes. i came across ur version of the hummus, ihave to say sounds extremey alluring. im itching to try it out. will let u know how it turns out. Beautiful looking blog and nice recipes!